Benzie County borders Lake Michigan and has over one hundred lakes, plus the major Platte and Bestie Rivers running through it. This beautiful county is part of the Lake Michigan Circle Tour, and a favorite destination for those who love to fish, kayak, canoe, walk along beaches, or just enjoy the magnificent views of the lakeshore. 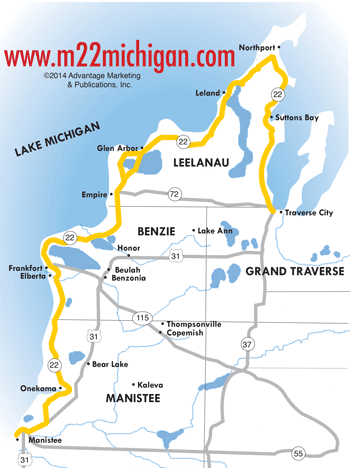 Benzie County is situated between Manistee and Leelanau Counties, and is a part of the M-22 highway tour. To travel the entire M-22 tour, we suggest you start at the southern most section in Manistee, and work your way north. Just about at the Manistee/Benzie county line, and about one mile north of Arcadia is a popular gem along M-22, called Inspiration Point or the Arcadia Scenic Turnout. Park in the roadside lot high on a bluff for fantastic views of the Lake Michigan shoreline and surrounding land. 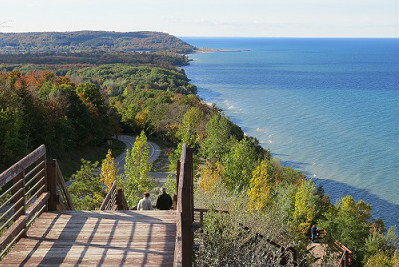 The lakeshore vista is even more magnificent if you climb the many stairs to a viewing platform. Read our story about Inspiration Point for all the details. Just a 15 minutes drive north of Arcadia, you'll come across the village of Elberta. Visit the clean beaches along Lake Michigan, try your hand at fishing and stop at Elberta's Waterfront Park and Elberta Dunes. Read more about Elberta here. Less than five minutes north of Elberta and around Betsie Lake, you'll reach the small, bustling city of Frankfort with a dynamic downtown to explore and enjoy. As you head out north of Frankfort, visit the Point Betsie Lighthouse, one of the most famous lights along the lakeshore. Read more about Frankfort here. US-31 runs right through the heart of Benzie county with personable Michigan towns along the way. Visit the Cherry Bowl Theater in Honor, Michigan, one of the last drive-in movie theaters in the nation, with the latest featured films, a miniature golf course and a classic 1950s atmosphere. Beulah and Benzonia have great dining options as well as unique boutiques. Near the Manistee-Benzie border, Crystal Mountain Resort offers exceptional golf during the summer and some of the best skiing and snowboarding around during the winter. Like Manistee County, you will find vast opportunities for hiking, kayaking, fishing and other outdoor recreation in Benzie. Benzie County may be the smallest county in the state of Michigan, but it certainly offers big fun!